Unassumingly stationed on the north side of Main Street Fort Walton Beach lies a century-old schoolhouse … and an Indian Temple Mound dating back to the year 900 A.D. So instead of whizzing by en route to the ocean, take a moment dive into the storied past of this seaside town – from the settling of the Native Americans to Spanish pirates to Confederate soldiers. As early as 12,000 B.C., humans began to dwell along what we now know as the Gulf Coast of Florida. They chose this place for the same reasons people long to live and vacation here today, for the climate and natural resources – or, more simply, the sun and the sea. The mound served as a village center and lookout. Today, you can climb it and do just that – but instead of a vast plain, you’ll see straight across Highway 98 to the shops and restaurants of Downtown. (Imagine the Mississippian Indian Chief popping over for a latte at Maas Coffee Roasters.) Quite a lot has changed since the first settlers learned to hunt and fish here. 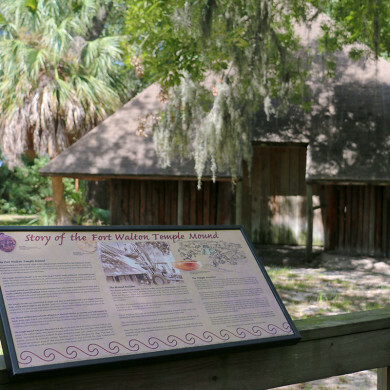 “The Fort Walton Beach Heritage Park & Cultural Center is here to connect locals and visitors with this important chapter of our history, and the chapters that would follow,” says volunteer Angela Snowball, who guides visitors on tour. A few yards from the Mound is a white clapboard schoolhouse that served the children of then-Camp Walton from 1912 until a hurricane hit in 1936. The fire department was going to burn it down as an exercise in the late 1970s, but the Junior League saved and restored it. During that time, Snowball tells us, cows and pigs ran loose. So the boys would head to school early to shoo the pigs under the house. Music was important in the classroom, as were languages. Children studied French from grades 1 through 12, with the addition of Latin in high school. The toys were all handmade, and the chalk was actually slate – white on black – for writing practice. There were three punishments in that day: a slap of the hand with a ruler, sporting a “dunce” cap in the corner, or placing one’s nose in the center of a circle drawn on the board. Heritage Park and Cultural Center is located at 139 Miracle Strip Pkwy SE, Fort Walton Beach, FL 32548. For more information, visit the Heritage Park and Cultural Center website or call (850) 833-9595.